News/Blog — Studio Mills "...a place to nourish your soul." On the Saturdays in April there was Kids Yoga for ages 5-12 at the new and awesome Bellevue branch of the Nashville Public Library, taught by Linda Mills and Brian Hallgren. We had as few as three and as many as 11 in class. The 45 minute class went by fast and hopefully each yogi got a positive taste of the good that a yoga practice can bring. This month, Linda is teaching from the Eight Limbs of Yoga and in particular, the Yamas, and the 30 Essential Poses of Judith Lasater will be integrated into each class. The Wednesday Tai Chi for Arthritis Series is on with Anna and there are only two more sessions, May 6th and 13th! Iyengar Yoga taught my Beth Nelson is Fridays 10:30-11:45 through May 22nd. 406 N Main Street, downtown Kingston Springs. Please feel free to join us after for food and whatever at our local watering holes. Jen Stone is taking a break from teaching weekly Power Flow classes on Thursdays, April-August 2015. Come join us on the water this summer for yoga, sun and fun for Paddleboard Yoga. Dawn is a Reiki master and has received the 9 rites of the Munay-ki to raise her vibrational level to transmit clearing and manifesting energy to others. She is offering chakra clearings, reiki, and energetic manifesting/shifting sessions at Studio Mills starting this spring by appointment only. These sessions last 30-60 minutes and are offered in exchange for a love offering. Dawn takes great care to clear you, herself and the space where this work is done prior to the appointment to ensure that only love and light enter. Please email her at dawnsong915@gmail.com for questions, to set an appointment, and to learn what preparations to make before coming. Be sure to check StudioMills Facebook Page. Its Sunday night as I write this, and I've been processing the past 2 days at Bethany Hills Camp for Linda's Spring Retreat. The weather was pretty forgiving though a little chilled at night, but that made the bonfire that much more appreciated. Thanks Agnes (Lindy) and all others who worked to keep the fires burning in the lodge and by the creek at the fire ring. If you missed the retreat, you might consider going the next time (there will be a next time). We spent around 39 hours sharing space, food and a deep appreciation for love and friendship, while getting our yoga on. Friday night we had a restorative class after sharing ourselves in an opening circle. Saturday morning, the 9AM class met with us and we had opportunities for massage time, ZytoCompass with Maggie Odle and Young Living Oils, Raindrop Therapy and even got our feet treated with Reflexology from Gaia and her girls from the Nashville Academy of Reflexology. Thanks to all you healers! Vivian, Sunshine, Maggie and Gaia. There was a Native American Indian ceremony Saturday that included hard-boiled eggs, flour, chewing tobacco and fresh daffodils stems and blooms, led by Maggie Odle, that encouraged us to let go of things we don't need or might be hindering our growth and invite good and beneficial things into our lives. 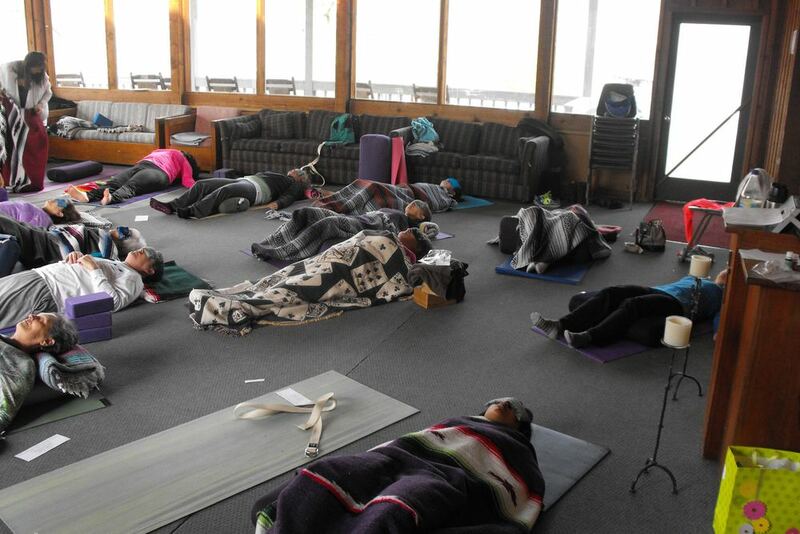 We had a total of 5 yoga classes over the weekend, an abbreviated Sacred Circle Dance, 2nd whopping bonfire, and Sunday morning pancakes from Chef David (great job!) and a special yoga class with 5 yoga teachers present sharing their yoga poses: Sheila, Marcy, GiGi, Brittany, Lindy and yours truly. There's a lot of energy there! I totally enjoyed this class and all the other events over the weekend. Including Marc's unbelievable Chocolate Chunk Cookies! Oh yeh! It takes a big effort to make this type of event happen and lots of planning to leave our homes for a day and a half. Let's remember to bless our petsitters and all who took over the wheel so we could chill out. 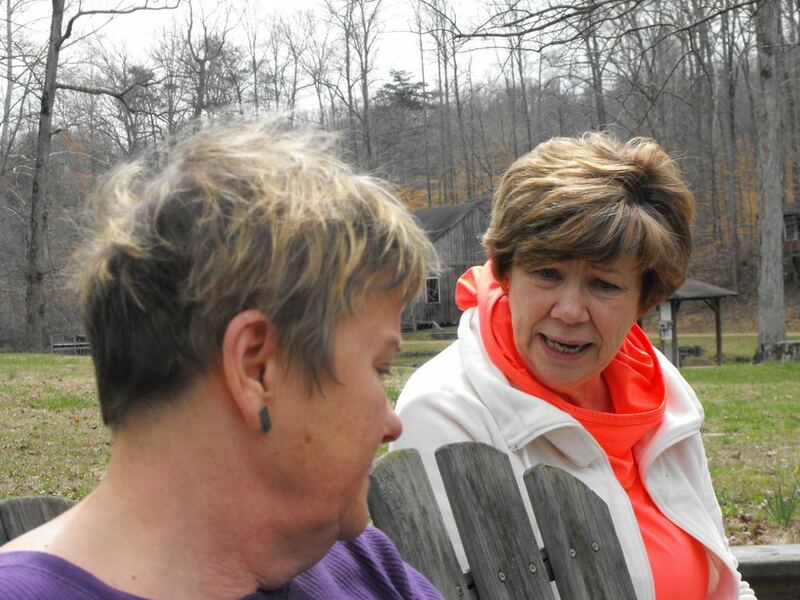 Are you joining us for Linda's Spring Retreat at Bethany Hills? It starts this Friday! Oh look. This rocker has your name on it. There are still some places open for a few more. Use our "Pay for classes" page or get your check in the mail or you can contact us to reserve your place 615.952.4864. The weather is supposed to be sunny and very slight chance of rain, high around 57, lows near 38. Be sure to bring your bed linens, towel, sleeping bag, and pillow. There's heat in the rooms and coolness outside. It's a retreat and a time to recoop from the stresses of daily life and winter in 2015. We'll have yoga, meditation, food, bonfires, peep frogs, quiet space, friends, reflexology, and massage, those last two for a reasonable price. Jen Stone starts Foundation to Power Part 2 Thursday evenings at 6:30. The six-week series is $75, walk-ins are $15, payable to Jen in class. Jen's a powerful teacher and she will encourage you to be your best. This is a great series! Beth Nelson is a certified Iyengar Yoga instructor and starts her next eight-week series on Friday, March 27th at 10:30 AM. In her words, "This class will focus on classical standing poses, seated poses, inversions, and relaxation poses". This series is $80, $15 for individual classes, payable to Beth at class time. Linda is teaching FREE Kids Yoga at the awesome and brand new Bellevue Public Library Saturdays in April from 11:15-12 noon for ages 5-12. 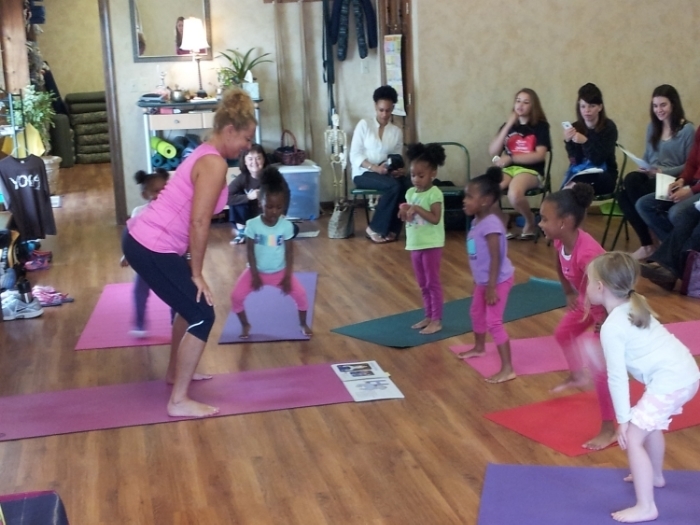 Kids yoga is a blast! It's so cute seeing those little fellers and little women doing poses with names like airplane, lizard and turtle. Even More Ready Now for Spring! I have so enjoyed hearing the varied stories from countless people about their personal experiences with our recent ice storm. When life as we ordinarily know it dramatically shifts...how do we handle it? For those who COULD not get out of their homes for about a week and for some even longer-major spring cleaning took place, organizing photos, getting ready for taxes, reading books, watching movies, over-eating, hobbies, game playing, cabin fever, new recipes without the usual essentials on hand, cold temperatures with no heat, arguments and reconciliations, fear, 22 deaths, broken bones from falls on ice, delightful bonding and sledding time with kids and MUCH more. How exciting it was to get to the grocery store at last for many! I had been hoping two weeks ago that we would have some REAL winter. We got it! I’ve got to say I don’t relish the idea of closing the doors for business, and losing an entire week of income, but it was the safe, logical and right thing to do. Barely anyone could show up for yoga class downtown Kingston Springs anyway. The ice storm also provided me a deep rest and opportunity for moving slowing and reflecting, and attention (for a change) to some of my whims in lieu of the typical running around I do to teach a dozen classes per week. It was like I say in yoga...a long exhale! I feel more complete and satisfied now from the winter coming to fruition, rested from the forced hibernation and ready for spring. Look forward to seeing you in class soon! There's still a bit of snow/ice left to melt and next week is forecast to bring 60s (! ), wind and a big taste of spring. I noticed a gaggle of robins in the neighborhood yards this past week and that's a sure sign of warmer weather. Class sizes have been larger this week as we missed a whole week of class the week before due to ice mostly mixed with snow. News for this upcoming week: regular classes will meet as scheduled, Jen starts her Foundation to Power Yoga Part 2 Thursday at 6PM. The six-week series is $75 or $15 for walk-in. If the first series is any barometer, the second series will help you to build greater strength, stability and endurance. And you'll probably sleep better. Beth is winding up her first Iyengar series Friday March 13th. A next Iyengar series with Beth will start shortly after that. Iyengar deals with alignment of bones, joints and muscles in a very unique way. I found the Iyengar system to be very helpful in helping me get my poses better defined. Our clocks, with exceptions, will need to be set ahead one hour on Sunday March 8th at 2 AM. I better do that Saturday night before hitting the hay. The added hour of daylight will allow us more time outside, I hope. The sunset picture above at Destin encourages me to rest assured that warmer weather is on the way. Time for friends, the great outdoors, deck-sitting, vacation, beach, pool, yard, play, music, camping, kayaking, lounging. They're all just around the corner. 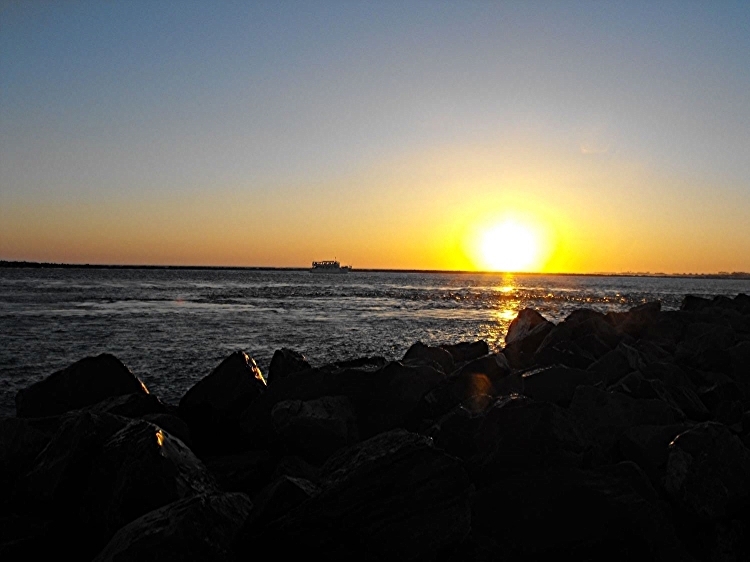 "I see the ice is slowly melting..here comes the sun!" Having grown up in south Florida with abundant sunshine and more clone-like weather every single season until my 30’s....I was SERIOUSLY hoping we would get more winter precipitation. My wish came abundantly true on Monday. I would have preferred snow rather than ice. But life closed down as we all know it. The white stuff did come. The responsibility of running around to teach 12 yoga classes in 8 different locations to over 75 people came to a screeching halt. To be unable to go anywhere (except where I would dare walk on ice in my neighborhood) was a welcome relief of rest and invitation to S L O W W A Y D O W N! Cabin Fever? I had none of it. I was totally thrilled and absorbed into being home bound-playing the piano again, practicing my flute, taking more time than ever to visit and talk to my 2 cockatiels, play with the dog, pet and enjoy the cat, plan the upcoming retreat, make phone calls to friends, watch a couple documentaries, by-passed getting the flu as I nurtured and witnessed my companion get through it and GET THIS! GOT MY TAXES ready to take to the accountant! It was a 3-4 day project and I’m relieved to have accomplished. Maybe I would have survived living in Maine after all! To all those missing their yoga fix, (Brian adds) you might start to build a file with some at-home substitute yoga. Our outlets and rituals of life are so calming and important to our structure. They were disturbed this week. The ice is melting and our normal lives as we know them in this community were “put on ice”. As we thaw...may we all bring something new and precious into our days from the chance to hibernate. Wednesday February 18th, snow/ice, one month/two days till spring! Life may slow down when wintry weather comes to our town, even to a standstill for a while, but we want to keep in mind that nothing stays the same. Warmer weather has to be around the bend. And we'll be so happy to see the time when the grass greens, new blooms pop on the dogwoods and the daffodils and crocus poke their little heads up from the cold earth. This is a time for some of us to recuperate and rest from the work of warmer months and prepare for the upcoming weather that will bring some cold, maybe some more frozen precipitation, probably some storms and rain, but most importantly we shall see new life all around us. For right now, I was saddened to see ice rather than snow, but we don't always get our way, do we? Linda and I went for a walk in the neighborhood with Red Dog, taking a few photos and catching some fresh, crisp air before the next round rolls in over the weekend. NOTE: Cancellations and postponements will be posted on Facebook and/or by email. That is our intention. We follow Cheatham County Schools' schedule. Coming up: Friday, February 20th, early bird pricing ends for Linda's Spring Yoga Retreat March 20-22 at Bethany Hills, save up to $55 now! >Jen's Foundation to Power Yoga 2nd Session was scheduled to start Thursday Feb. 19 (tonight) at 6:30 has been cancelled due to the weather. We attended the Introduction series of six 75 minute classes and felt totally stretched, flexed and exhilarated each night. Slept very well those nights too. >Beth's Iyengar Yoga classes have been great as well! She's a wonderful instructor too. The Iyengar system of Yoga focuses on alignment of muscles, bones and joints for better health and state of mind. Two more classes are left in this series and another starts in a few weeks. Watch for details. This is a Friday morning 10:30 class. Great job Beth and Jen! The Full Class Schedule for Studio Mills is here. See you in class soon! January 31st And snow may be coming! We are working to get our blog out Saturday after 9 AM class to update and encourage you about what's happening at Studio Mills this week and upcoming. So much fun last night as Circle Dance came to the Studio and 10 people attended. A short video of last night dancing is here of Walenke Funk, a fusion of tribal dance and jazz. It's Fun! We learn traditional dances from around the world along with newly choreographiced dances to a variety of world music. Dances range from slow and meditative to quite lively. Circle dance is a means for relaxation, joy, growth, awareness and healing. We did a dance in memory of Jagger, son of David and Heather, longtime local circle dance leaders who have relocated west. The laughter and fun was on, as you can see on the video. Make your Reservations now for the Spring Yoga Retreat March 20, 21,and 22 at the serene Bethany Hills Retreat in Kingston Springs. Early Bird Pricing is only available until February 20th. You need to RSVP and pay for your spot on our payment page or in person. Led by Linda Mills, it is assured to be relaxing, refreshing, energizing and calming for all who attend. And who knows? Maybe your people at home know its something that you need. No harm intended. March/Spring/Vernal Equinox on the 20th is a day when day and night are equal length and it's the first day of Spring! Email or call now to reserve your spot for the Valentine's Couples Party. It's FREE, donations are optional, and we'll do easy yoga poses together, Thai and Breema-type massage, and celebrate our love, 'cause that's what it's all about! There were seven at the beginners class this morning, including four of them new to yoga. LInda and I wanted to present a class that would describe what yoga is to us: awareness of how we treat others and ourselves, looking within ourselves the poses, breath work, withdrawing the senses, all leading to stilling and calming the mind for meditation. I think it went well and hope to see some if not all of the new students in a class at Studio Mills in the near future. In yoga, we use a mat, blocks, blanket and straps. Sometimes more. You can purchase these and other goodies at the Studio Mills Yoga Store inside the studio. All items are reasonably priced and available right now! Also, Linda loves leggings, if you don't know. She has made a large purchase and offers a variety of designs for $20 each. They are the rage! You'd find them for up to $75 online. Sorry, but she won't trade for chocolate chunk cookies. The treats DO have great value though. Thanks, as always, Marc. The March 2015 Yoga Retreat at Bethany Hills outside Kingston Springs is now taking reservations. Details here! A yoga weekend, food and solitude for you. Make your plans and reservations now. A donation based Valentine's Couples Yoga Party is planned for February 15th. Couples Yoga is fun and brings people closer. A fun evening is in the planning stages. You need to RSVP to this so we know how many are interested and committed. Since returning from a 2 week vacation in Florida with paradise weather, surrounded by love of family, and the time aside for leisure...it seems I’ve been on a marathon of busyness. A turn of the calendar, a fresh start can do that for me every year. For those entrepreneurs out there...you know how challenging it is to create income ALL ON YOUR OWN. It’s motivating, stimulating, isolating and often times quite scary. I’m open to finding ways to keeping the doors open at Studio Mills another year. Hmmmmm. The prices went up a bit and I’ve been more than nervous to present them. Prices go up everywhere sometime, don’t they? We have 2 new classes and I’m so grateful for Jen Stone for her Power Flow yoga on Thursday evenings and Beth Nelson for teaching Iyengar on Friday mornings. I have committed personally to participating in both of these classes in January and February. When you teach for 7 years, and are responsible for over a dozen classes weekly-it’s a true luxury to be “the student” again. Anna Hornsby got certified in Tai Chi for arthritis and about 10 of us enjoyed her complimentary class this week. We hope she also adds a Tai Chi 6-8 week series starting in February. If the students commit-we will add that to our schedule. I'm so thankful to these ladies and also to Brian Hallgren, my sweetie, for their gifts to Studio Mills and our community. Thanks again Brian for the web-site. I recently became a distributor for Young Living Oils and attended classes to become more knowledgeable and inspired and intend on utilizing these healing oils in my yoga. I attended a Raindrop Therapy demonstration last Sunday and it seems I’ve had a recurring sinus headache ever since. A coincidence maybe or a detox for me vicariously? And I wasn’t the one on the table receiving the Raindrop treatment! This is not like me to have a headache EVER! My head is spinning with new ideas for classes, planning the retreat coming up in March, and life’s callings. This morning when I woke up with the throbbing ONCE AGAIN in my forehead, temples and head my beloved reminded me that I could try some yoga therapy and essential oils for my headache. With the help of Advil, the Iyengar series for sinusitis (lots of inversions to change my perspective), Panaway on my temples and StressAway in my diffuser-I feel I’ve found some great relief for now. Time to take some of my own medicine! Hope to see you all in classes in the days ahead. It is so invigorating to have new students and returning student/yogis in class. My Tuesday night was made a little better last week when the first into the Studio was a new student . He had been encouraged and witnessed to by a 50something man student who started about a year and has had pretty amazing medical and physical results since starting a yoga practice. Hopefully, the new yogi will be back, he said he enjoyed the class. We love the excitement and commitments of new students who find benefits with yoga. We’re building strength, stamina/endurance and flexibility in working with our postures and adding Yogic philosophy in our classes. We hope you’ll join us in a class soon. The complete schedule of classes and upcoming events is available at our website. Great Classes, Jen and Beth! Jen Stone's Foundation to Power Yoga 6 week series started Thursday night and we (8 of us) studied the beginning poses of the Power Flow movement by movement. It is not surprising that body movement, whether fast and intense or slow and holding each pose, heats the body up. The temp in the room was around 72 and my head was wet. This is a class that anyone can do and if you're game for a new exposure to a stronger class, it continues this Thursday at 6:30pm for 75 minutes of instruction and a nice and well deserved relaxation afterwards. Friday morning Beth Nelson who is a Certified Iyengar instructor started her 8 week class, teaching us (7 attending) to feel and move muscles, like rolling the upper arm inward, the inner thigh toward the rear, the sacrum forward. This instruction aids us in developing our body awareness. Iyengar Yoga was my of yoga foundational beginnings, so I feel right at home in this class. Maybe you can join us at 10:30 Friday mornings for the special series, 60 minutes worth and savasana. I think its important to break the poses down as Beth so competently does. Coming up this week besides the above and regularly scheduled classes, Wednesday evening instructor Anna Hornsby is offering a FREE TaiChi class from 5:30-6:20. Tai Chi is a gentle, slow moving meditative exercise that began in ancient China around 500 years ago. It combines stress reduction and good posture with movement to improve health.You can practice Tai Chi in regular comfortable loose fitting clothes and flat shoes. Tai Chi consists of fluid, gentle, graceful and circular movements that are relaxed and slow in tempo.Breathing is deepened and slowed- aiding visual and mental concentration. The Tai Chi for Arthritis program is developed by Dr. Paul Lam a Tai Chi Master in Sydney, Australia, together with a team of rheumatologists and physical therapists. It is built on the Sun style of Tai Chi. Even if the program was developed for people with any kind of arthritis and elderly people with balance problems, it is a very good program for anyone who would like to enjoy the benefits of practicingTai Chi. Benefits of Tai Chi for Arthritis include: Increases muscular strength and flexibility.Decreases pain in joints.Decreases stress.Helps reduce high blood pressure.Increases sense of well-being.Improves balance and risk of falling. I intend on being in each of these classes this week and more. What about you? I have never allowed myself the luxury of a two week vacation until this past December. Being in south Florida in my old ‘hood with paradise temperatures EVERY day, having loving family nearby to visit, (parents age 87 and 93 still vibrant and playing tennis), HUGE ripe avocadoes 2 for $1.00, tennis, sunrises, swims and walks on the beach, watching the transitions of the ocean, and bike rides were pretty darn spectacular. Came back to dreary Nashville weather, but also came back to loving friends and great yogis at STUDIO MILLS which truly ignites my passion. On Thursday, New Year’s Eve, I was thrilled that 12 yogis showed up for my Candlelight Yoga and Burning Bowl ritual class from 6:30 p.m.-8:00 p.m. What a wonderful way to bring in 2015! Brian and I even found ourselves up and awake for the ball drop at midnight. I’m looking forward to putting fresh classes together for you in this New Year. Hope to see each of you in class. So many things have been spoken over the past two years between Linda, me and yogis who are committed to their yoga practice and regular students in class. We want you to come back or keep coming to class, attend different classes and our other events. Expand your horizons, experience the transformation that yoga can bring. The tree has bore fruit. We have this new website(a year in the making) and as you can see in the class schedule that a lot is happening this year, in the line of a March retreat, Jen's Thursday night "Foundation to Power" 6-week series starting this Thursday, Beth's Iyengar 8-week series starts Friday, and our regularly scheduled and wonderful weekly yoga classes. These are offered so we all can experience some fundamental building blocks that prepare us for resilience to stress and illness, increasing our openness and flexibility, strength (physical and inner) and endurance. I personally am planning on doing Jen's and Beth's classes because I want to work on my personal yoga. As instructor of the Tuesday night Elements class, I sometimes lose inspiration. Preparing music, flows, poses takes time and usually the plan changes when yogis show up for class. I need to be a student sometimes so I can feel more of what yoga is doing for me. My intention is to share my yoga with you as you share your yoga with me. We hope you like our new website. Our goal is to make it simpler, more informative and current. You can help keep your local yoga studio open by attending class regularly and supporting our mission, which is YOU. The community in Kingston Springs and surrounding areas will become more tight knit and live better as a unit of care and compassion. Feel free to comment and "like" our comments/posts. Thank you and much gratitude to those who get their yoga on at Studio Mills commitedly. We appreciate you and value your friendship. The Divine in me sees the Divine in you. I realize this, that we are connected and one. I say, "Namaste". Beth Nelson is a Certified Iyengar Instructor. She has been studying yoga for over 20 years, and teaching since 2000. In addition to teaching yoga, she is also a Licensed Professional Counselor in private practice in Nashville. Beth is teaching a new class at Studio Mills, which starts in January, 2015, and is for students new to Iyengar yoga, or who have had some exposure to Iyengar yoga and would like to learn more. Beginner poses are challenging and rewarding! This class will focus on classical standing poses, seated poses, inversions, and relaxation poses. The poses that are learned in this course are a necessary foundation for all continuing study in the Iyengar method. This will be an 8 week course, for $80, if paid for in full. Drop in fee will be $15. Classes are 75 minutes long, and will be held Friday mornings at 10:30. Start date is January 9th, the 2nd Friday of 2015.